In a ceremony today at Hilles Hall, Harvard University resumed a connection with the Army Reserve Officers’ Training Corps (ROTC) that started in 1916. That connection was interrupted when ROTC offices on campus closed during Vietnam War-era protests. In the intervening 40 years, Harvard students at the University continued to join ROTC units at the Massachusetts Institute of Technology. For the first time since 1971 an Army ROTC unit now has an office on campus. The official physical presence marks another step in Harvard’s reconnection with the military that began a year ago. Last March, the University announced it would soon welcome ROTC back. In September, a Navy unit opened an office in Hilles. The decision to renew ties with ROTC was predicated on the expiration of the “Don’t Ask, Don’t Tell” law, which banned gays from the military. The law expired on Sept. 20, 2011. “Today we celebrate the latest chapter in the shared history of the University and the United States military,” said Harvard President Drew Faust in brief remarks. That history is always on her mind, she said, since her home (Elmwood) and her office (Massachusetts Hall) both served as hospitals for the Continental Army during the Revolutionary War. “Today we celebrate the latest chapter in the shared history of the University and the United States military,” said President Drew Faust during a ceremony at Hilles Hall. The Army ROTC presence will be more than an office. Starting immediately, ROTC cadets will conduct physical training on campus once a week. And by September, some ROTC freshman courses in military science will be offered in a Harvard classroom as part of a pilot program. She thanked Harvard general counsel Robert W. Iuliano, who took the lead in negotiations with the Army. And she thanked faculty members Nicholas A. Christakis and Kevin Kit Parker for co-chairing an advisory committee that made the practical arrangements for the new ROTC office. Christakis is a professor of sociology with the Faculty of Arts and Sciences and a professor of medical sociology and professor of medicine at Harvard Medical School. 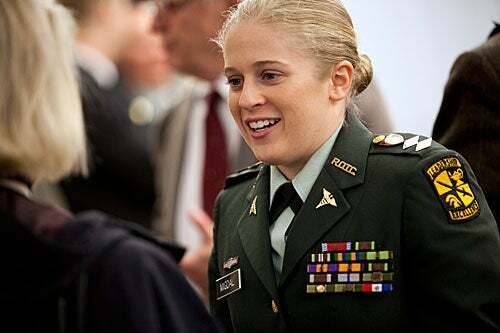 Parker, a major in the Army Reserves, is the Tarr Family Professor of Bioengineering and Applied Physics at the Harvard School of Engineering and Applied Sciences. Parker missed the September ceremony, Faust pointed out, because he was in Afghanistan on one of his multiple deployments. Both the Navy and Army offices at Harvard are part of an ROTC consortium of six local colleges. Nine midshipmen from Harvard are enrolled in the Navy unit, called the Old Ironsides Battalion. Six cadets from Harvard are currently part of the Army ROTC’s Paul Revere Battalion. Harvard ROTC students, including Air Force cadets, will continue to take military science classes at MIT, where they have trained since 1976. Hammonds mentioned two examples. Neil Rudenstine, former president of Harvard, was commissioned an Army officer in 1956. He had been an ROTC cadet at Princeton University. Maryland Lt. Gov. Anthony G. Brown ’84 was an ROTC student in college and is now a decorated colonel in the Army Reserves. He served in Iraq, the highest-ranking U.S. public official to do so. 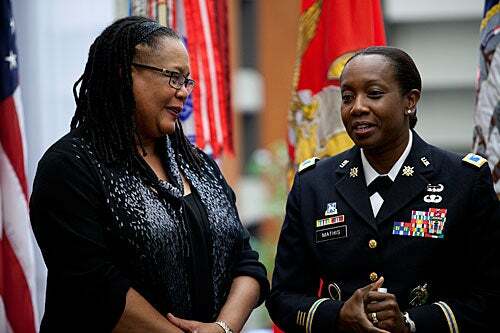 Harvard College Dean Evelynn M. Hammonds (left) called the military a form of public service that benefits from the “rigorous liberal arts education imparted at Harvard.” Here she is joined by Army Col. Twala D. Mathis, commander of the 2nd ROTC Brigade. Army Col. Twala D. Mathis, commander of the 2nd ROTC Brigade, also touched on history and public service. Five current Harvard buildings were used by the Continental Army, she said — Wadsworth House, Holden Chapel, and Massachusetts, Harvard, and Hollis halls. also mentioned three Harvard men, all Army officers, who were awarded the Congressional Medal of Honor: Theodore Roosevelt, A.B. 1880, Maj. General Leonard Wood, M.D. 1884, and Theodore Roosevelt Jr., A.B. 1909, the only general officer to land with troops in the first wave at Normandy on June 6, 1944. 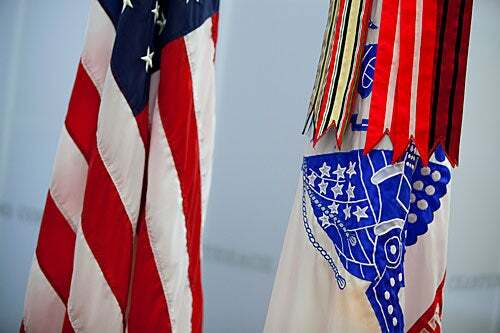 Since 1989, he said, 88 Army second lieutenants from Harvard have been commissioned — 13 just in the past three years, including one Rhodes Scholar. Victoria Migdal (pictured) speaks with guests before the ceremony begins. During a late-afternoon reception, a common room in Hilles near the new second-floor office was crowded with men and women in uniform mingling with University officials. Guests of honor included 90-year-old Robert Coolidge Davenport ’44, a retired major general in the Massachusetts National Guard. He served as an Army officer in World War II and was in the Pacific Theater with the 27th Division when two American atom bombs ended the war. Another was Kevin Ryan, a retired Army brigadier general and now executive director for research at the Harvard Kennedy School’s Belfer Center for International Affairs. Army combat veteran and University of Pennsylvania graduate Erik Malmstrom — a current Harvard graduate student and co-president of Crimson Serves — was also at the ROTC ceremony. Bringing Army ROTC back to Harvard “continues a really positive trend we are seeing,” he said. “ 'Harvard's Great Teachers' is a video series that showcases our faculty sharing their ideas, talking about what they do in the classroom, very much in the liberal arts tradition,” said FAS Dean Michael D. Smith. Among the faculty members who will appear in the initial set of videos is Thomas F. Kelly, the Morton B. Knafel Professor of Music, (pictured).